I love that I can clean the window with one side and flip to the squeegee to make it crystal clear. The telescoping handle makes my work so easy. My adult kids did my house Windows last weekend and they look great. The first one I received was broken. The knob that holds wand on was gone. The replacement will not telescope. There must be a way to open it by twisting but I cannot make it work. Not worth it. Very hard t use as you need arm strength . To clean the windows in our house. At 48" we should be able to reach them without having to get on a ladder. It looks like it would be very convenient to use to clean the windows in the sunroom. To clean my windows without a ladder. I have a garden window that is almost impossible to reach inside to clean. Easy to clean my picture windows. I'm short can reach top of windows. It's very good for someone like me. Looks like would be easy to use. We have a lot of windows and some have bushes in front of them. Looks like this would reach over buses to wash windows. Cleaning home to get ready to sell. This was perfect size (wider and bigger) and does fantastic job! Can wash, too. Shower cleaning for a big man who has trouble bending. Good value and desperately needed. I have been struggling to wash my windows outside. No ladders. It saves me the time and convenience of not using a ladder outside. To clean outside house Windows. Easy for me to do. Ease in washing high windows. I have a high glass storm door on porch. It's hard to reach. I've only used once. It made it so much easier to reach the top of door. I have large windows and can not reach them to clean. Live on side hill, no flat place for ladder to reach outside windows. Need to keep feet on ground and still reach windows. To wash windows. It reaches the top so I can clean standing on the floor. 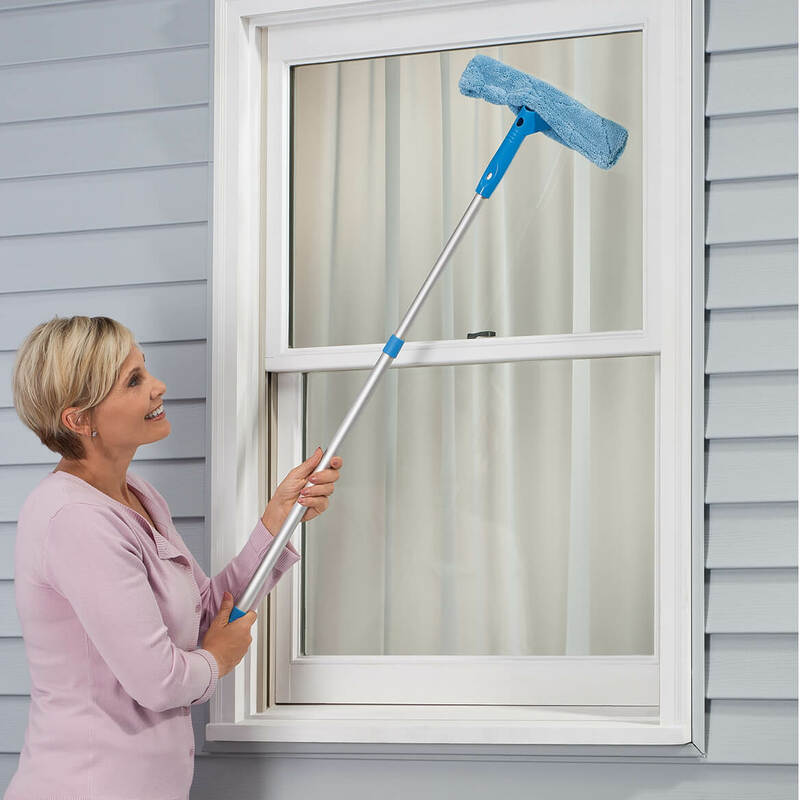 Looking for a way to save myself so much bending and stretching when cleaning my windows. I am age 70 and have 5 windows I cannot wash on the outside of our house. This looks like something I could use to wash those windows. The windows in my apartment are very tall and this will make it easier to clean them. I have super large mirrors. Thought this would help this old girl get the job done. BEST ANSWER: It is easy to use. 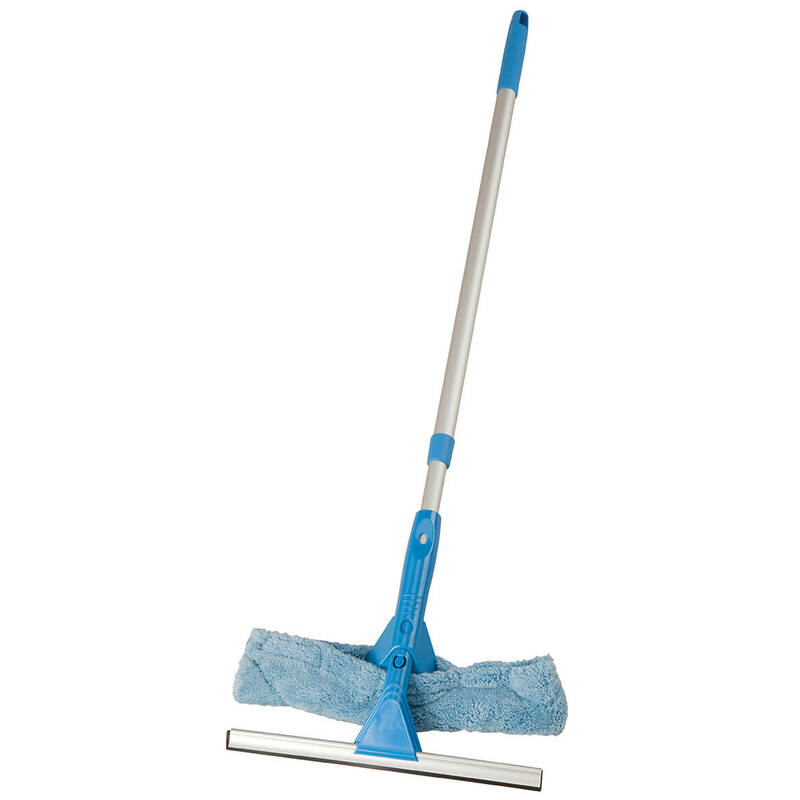 The telescoping handle is easy to lengthen and shorten, and if you want, the squeegee part can be removed to just use the soft blue cover, which also removes for washing. 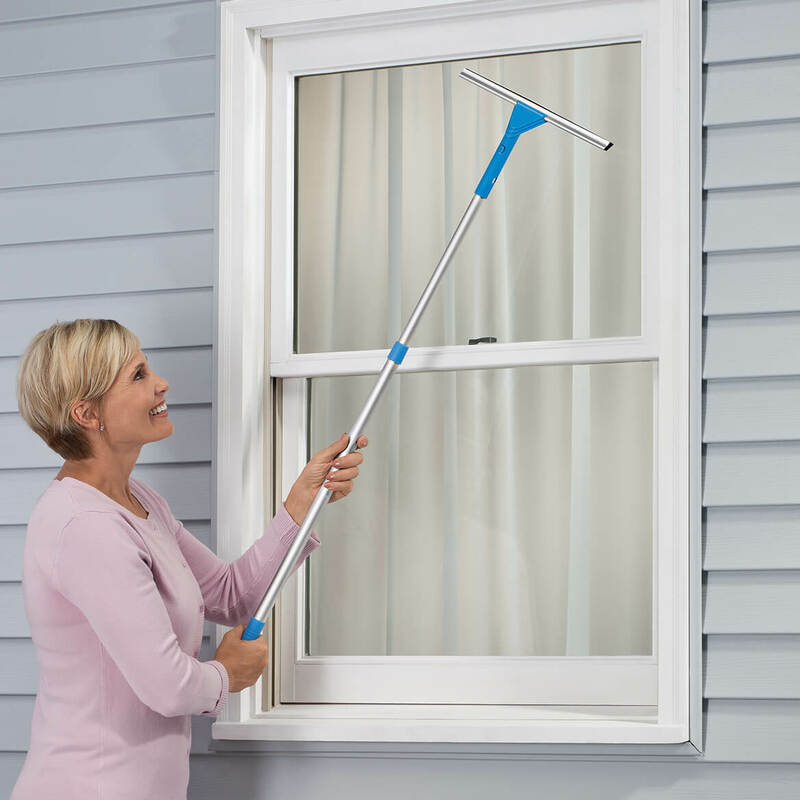 I am not sorry I bought this because it makes cleaning the balcony doors easier, or anything else higher up. I would recommend this product. I hope this helps. I don't know how it works either. Haven't been able to decipher?? i need something about 10' long for my windows even with a ladder. help///??? BEST ANSWER: This will not work for 10' as at its full length is only about 5 feet long. I'm sorry I couldn't be of more help.